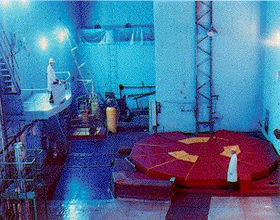 Obninsk APS-1 was the first nuclear power plant in the world. The world's first nuclear power plant becomes operational in Obninsk, outside of Moscow.The nuclear reactor, used to generate electricity, heralded Obninsk's new role as a major Soviet scientific city, a status it retains in the Russian Federation where it carries the sobriquet of First Russian Science City.Obninsk, population 108,000, currently houses no fewer than 12 scientific research institutions and a technical university. Research is focused on nuclear-power engineering, nuclear physics, radiation technology, the technology of non-metallic materials, medical radiology, meteorology and environmental protection.Since the plant opened in 1954, most of the industrialized west, along with countries like India and China, have embraced nuclear power. But the backlash against this energy source continues in the wake of accidents such as those that occurred at Chernobyl and Three Mile Island. Italy, for example, has decommissioned its nuclear plants and two other European countries, Germany and Sweden, are considering doing the same thing.